STOCKTON, Calif. (November 2, 2016) – The Port of Stockton has won this year’s top honors for excellence in advertising from the American Association of Port Authorities (AAPA). The 2016 AAPA Communications Awards for exemplary communication projects was awarded at the AAPA’s 50th annual convention held October 23-26 in New Orleans, La. 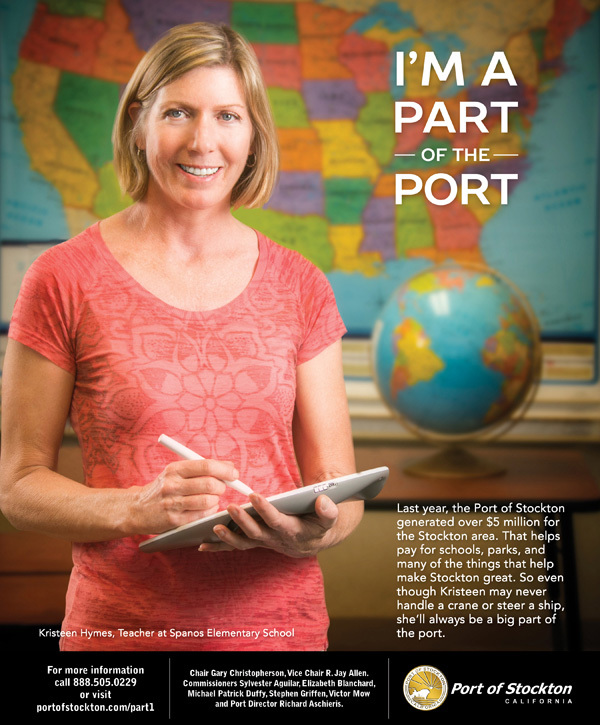 Port of Stockton’s “I’m Part of the Port” campaign went up against ports in North America, Latin America, and the Caribbean. The campaign was developed to promote t he vital role the Port of Stockton plays in the growth of California’s Central Valley, providing a link between area growers, ranchers, businesses and trade partners around the globe. The highly successful series of ads offer thumbnail profiles of individuals who directly benefit from the work of the Port of Stockton including: importers, local schools that benefit from $5 million in tax revenue from Port operations, and even wildlife, specifically the owl boxes that help keep the rodent population down and promote stronger levees. The Port Marketing Brochure was also selected for an Award of Distinction in the Promotional category and the Port’s partnership with a local sculling center to donate a boat (Spirit of the Port) for people with disabilities garnered an Award of Merit from AAPA. For more information about the 2016 AAPA Communications Awards visit www.aapa-ports.org. Located in California’s fertile Central Valley, the Port of Stockton is the premier bulk/break-bulk port in California, supporting more than 5,500 family-wage jobs in the greater Stockton/San Joaquin County region. Situated on a deep-water shipping channel, with over 7 Million square feet of warehouse space, at the hub of four major freeways and served by two Class I railroads, the Port of Stockton is strategically located to provide efficient goods movement throughout the Western United States. To learn more about The Port of Stockton, visit www.portofstockton.com.